Malcolm Smith Mercer’s remote ancestors were among the Huguenots who left France and settled in Holland. Later they migrated to England and finally moved to Ireland. A later generation crossed the Atlantic to establish a home in Pennsylvania, when it was a British Province, after which they came to Canada as United Empire Loyalists. Malcolm was born in a farmhouse on the 5th line of Etobicoke. He was educated at the St. Catherine’s Collegiate Institute, the University of Toronto and Osgoode Hall. In the legal profession he rose to eminence. 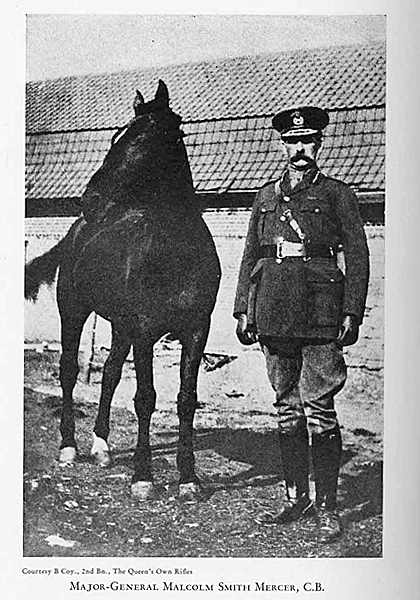 Lieut.-Colonel Mercer marched out of Toronto on the 22nd of August, 1914, at the head of a contingent of 700 officers and men of the Queen’s Own Rifles to entrain for the first lap of the journey to Europe. Much gallant service against terrible odds including poison gas soon led to his promotion to Major-General and later to be mentioned in a dispatch from Marshal Foch, the Commander-in-Chief to Sir John French, the British Commander. His crowning distinction, however, was to be summoned by His Majesty the King to have conferred on him Companionship in the Most Honourable Order of the Bath. He won the devotion of the officers and men of his command by his consideration for their welfare. For instance, he was insistent that no man should be given dangerous work to do unless it was absolutely necessary. 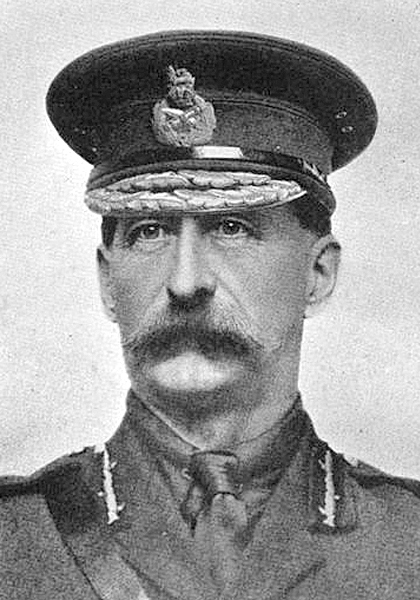 When it was proven that the Ross rifles were inferior to the Lee-Enfields, it was on his report that the 2nd and 3rd divisions were re-armed with the better rifles. In 1916 much fighting developed on the salient between Elio and Boosinghe. Military strategists were divided on their opinion as to whether the salient should be defended. Whatever may have been General Mercer’s views on the question it was enough for him to know that the High Command wanted it defended. This caused him to throw all his energy and skill into the task of directing its defence the task which cost him his life. His command, the 3rd division, was stationed on the Sanctuary Wood sector at the apex of the salient. On the night of June 1st, reports reached the General that the enemy had dug some saps nearby. He immediately determined to go forward personally to the danger zone to ascertain the conditions. According to custom, his approach was heralded by telephone so that the officers could be prepared with the desired information as he proceeded with his inspection. The telephone message was picked up by the Germans’ listening posts. Knowing of the presence of a Major-General within the range of their guns, the Germans early in the morning began a barrage lasting several hours. The General was wounded by shell fire quite early and was being taken to a regimental aid post when he was again struck down. Before the day was ended the vital spark had fled, but not before the enemy had over-run that part of the salient and captured several officers including the General’s aide-de-camp. The Germans promised to bury General Mercer’s remains with military honours but they failed to do so. When the Canadians recaptured the ground, his body was recovered and taken to the military cemetery near Properinghe, where it rests in a hero’s grave surrounded by many of his officers and men. Canada honours the memory of three Major-Generals who gave their lives for her on the field of battle: James Wolfe on the plains of Abraham in 1759, Isaac Brock at Queenston Heights in 1813, and Malcolm Mercer at Sanctuary Woods in 1916. Malcolm S. Mercer was not only a brave and brilliant soldier, but he was also a most exemplary Mason. As a young man he had been initiated in River Park Lodge No. 356 G.R.C. in the village of Streetsville, which was near his birthplace, where he attained the rank of Worshipful Master. After coming to reside in the West Toronto Junction area he affiliated with Victoria Lodge, No. 474 G.R.C. A perfect ritualist, his tall form and grace of movement as he interpreted the language of our beautiful ritual was an inspiration to the younger members of Victoria in its early days, and, doubtless, was a potent influence in the perfection of the work of that lodge.